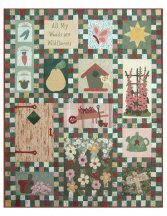 Quilt Size: 32" x 40"
This Sew Simple Samplers™ pattern is one of my favourites! 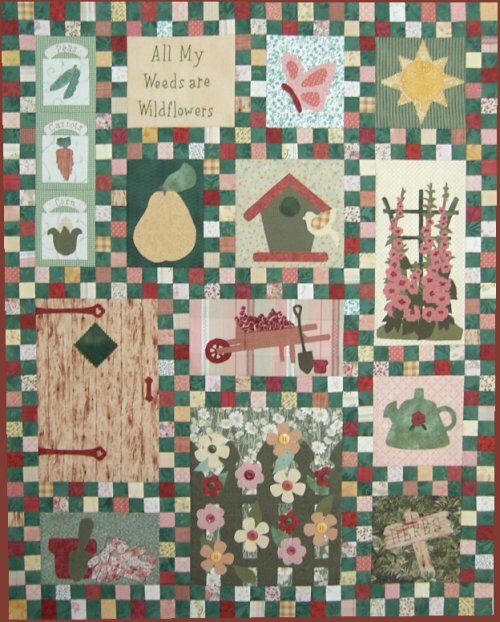 With a summer garden theme, you can create this lovely, simple wallhanging. To see members versions of this pattern, click here. ¾ yard tone on tone dark green for the border plus at least 4 different colours of fat quarters for the alternating colours of the border. The more fabrics used, the scrappier the look. ½ dozen fat quarters of a variety of yellow fabrics. Include tone on tone and small subtle prints. ½ dozen fat quarters of a variety of peach to rust fabrics. Include tone on tone and small subtle prints. ½ dozen fat quarters of a variety of green fabrics. Include tone on tone and small subtle prints.